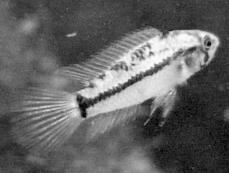 Back in the mid 1980’s I became interested in dwarf cichlids by hanging out with a friend I met at a GSAS meeting. Dwarf cichlid books were less available then but while browsing through the pictures of fish that I had never seen in the shops, I noticed Apistogrammoides pucallpaensis, the T-bar dwarf. David Soares, nationally known breeder and speaker, brought several species of dwarf cichlids to the Oct 97 meeting. When he told me that he had the T-bars I jumped at the chance. I purchased all 15 of the 1/4-inch fry that he had. They were placed in a twenty gallon tank with lots of Java moss. I fed them mostly baby brine shrimp, and a little flake food. Growth seemed to be slow but after about three months I could identify a male and a tiny 1/2-inch female. Several caves were provided as spawning sites and shelter for their comfort. My tap water is very soft, and T-bars prefer neutral water, so I didn’t have to add anything to adjust the water chemistry of their tank. After about four months I noticed that my female had turned yellow and black. She was chasing everything away from her cave. Four days later I observed a small batch of tiny fry near the entrance to the cave, closely guarded by the female. Although the male was kept at least two inches away from the brood, he was still protective, chasing the other cichlids away whenever they tried to swim near the fry. Since baby brine shrimp were being fed regularly the only additional food offered was microworms. Mom kept them in a tight group for about four weeks before they began to venture out on their own. I lost a several to predation at this point so the pair was placed into their own tank for the next spawn. Once the fry were free swimming I removed the male just to be sure. Like a devoted parent, she herded them around the bottom of the tank hunting for food. In a month when they had dispersed I started to think about putting the pair back together again but there was no unoccupied tank available. A few more months went by with the fry eating and growing to about one half inch size. While feeding the tank one day I was amazed to observe the adult female showing her yellow spawning colors. Possibly she was showing off for the adult males in the adjacent tank. A few days later she was defending a cave from the previous brood. Then I saw fry! How could this be? Looking hard to identify a male in the group none was obvious. I still don’t know which one is the stud. 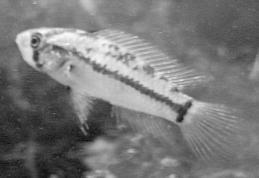 Apistogrammoides pucallpaensis is not a striking fish but being one of the smallest cichlids it has a charm all its own. The ease of keeping and breeding this fish make it a good candidate for a quiet planted tank. Finding them is the hardest part. Your greatest chance of obtaining a pair is to ask at your next GSAS meeting!